In An Eastern Orthodox Perspective, Jefferson Vann examines a new translation of the New Testament, and compares the author’s treatment of the concept of final punishment with his own. Conditionalists voice our dissent against the traditional Western church understanding of human nature and destiny. Our arguments are with theologians like Augustine, whose teaching led to a widespread belief that most of the people God created will eventually be tormented perpetually. Recently, I was walking around my local library in Williamsburg, Virginia, U.S.A., and came across a new book which reminded me of another ancient perspective. The book is a new translation of the New Testament, written by Eastern Orthodox scholar, David Bentley Hart. For Hart, the “Fire of the Age” is a final punishment which is probably of a “long, if indeterminate, duration” but its duration is not the point. The point is that it is an event of another time, another age – an eschatological Age. We conditionalists might be drawn to such a translation merely due to the fact that it draws the discussion away from the Western insistence that aiōnios always refers to perpetual activity. But perhaps we should examine the basis for Hart’s approach more carefully before aligning ourselves with it. Here we see more clearly the difference in perspective, a difference which helps to clarify Hart’s view of final punishment by distinguishing it from the traditionalist approach on the one hand, and the conditionalist approach on the other. The purpose of the “fire of the Age” is “the chastening of that Age,” i.e., punishment with a view toward eventual restoration. The “chastening of that Age” does not seem accurate to either traditionalist or conditionalist ears. The traditionalist is not prepared to give up a hell that lasts forever, whereas we conditionalists are not prepared to give up a hell that destroys forever. The “life of that Age” is an equally uncomfortable translation for both the traditionalist and the conditionalist. While the followers of Augustine cannot imagine a human soul who does not live for eternity, even we believers in life only in Christ are not ready for a destiny which is not explicitly eternal. But “the life of that Age” extends no such explicit promise. This translation allows the final punishment to be just that – a punishment which finally and completely deals with rebellion and sin, without making sinners immortal. But it also preserves the full meaning of the promise of Christ to believers, that their lives will be permanent. The punishment is permanent death, but the promise for the faithful is permanent life. Like Hart, we conditionalists do not believe there is an “absolutely unquestionable scriptural warrant” for belief in “the everlasting torment of the reprobate.”5 But, unlike Hart, we do believe that the wicked will be permanently destroyed. 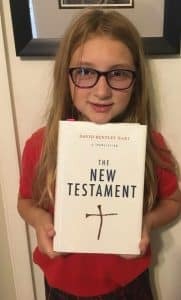 (A special thank-you to my granddaughter, Elena, for posing with Dr. Hart’s book).